Building a meaningful and satisfying career is at the top of many people's life goals. Like many millennials, I have often received career advice along the lines of “follow your passion”. Although it sounds great, it is hard to put into practice. One can’t help but notice the dissonance between the current emphasis on passion at work, and the lack of avenues to build meaningful careers. The term “follow your passion” has increased nine-fold in English books since 1990. Yet many are not even sure what their passion is. Recently, Stanford psychologist Carol Dweck asked her students, “How many of you are waiting to find your passion?”. Dweck’s point was that passion is not something you just come across. Instead, it’s nurtured and developed over time through trial and error, grit and resilience. If we quit every time we encounter a stumbling block and blame it on a lack of passion, we are never going to grow and develop as professionals. This issue of personal growth and responsibility is becoming ever more pressing as technological change is transforming the way we work. In addition, increasing life spans are dramatically lengthening our careers, making it all the more important to find work that is fulfilling. 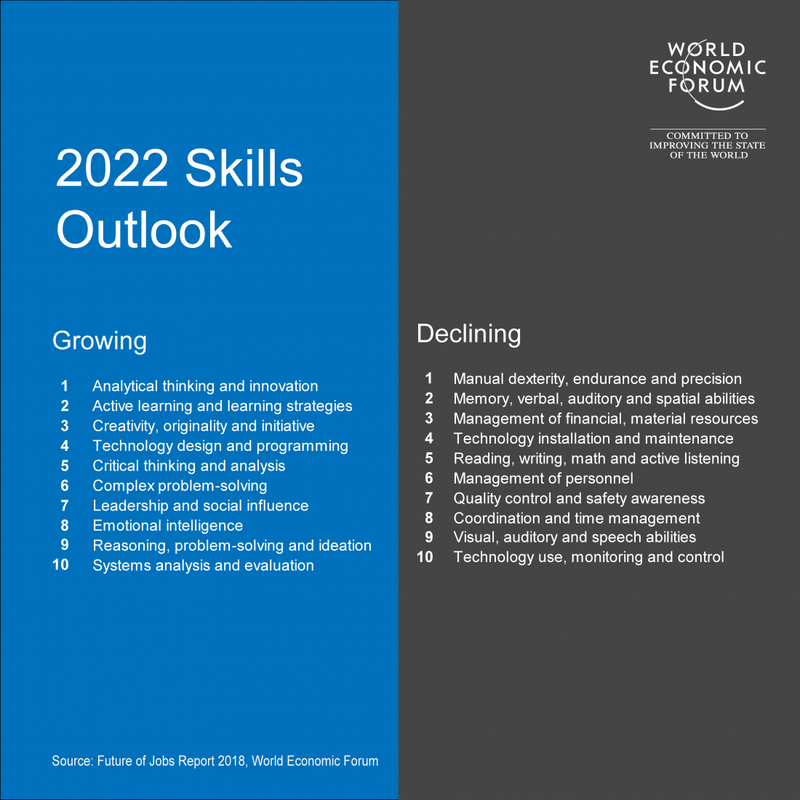 The World Economic Forum’s “Future of Jobs Report 2018” examines how technology is changing the very nature of work. It highlights the new skills we will need for the jobs of the future, and examines how artificial intelligence can augment existing jobs, create new tasks, and open up an entirely new range of livelihoods for workers. Crucially, the report recommends taking personal responsibility for our lifelong learning and career development. Change begins with personal transformation. To see how this works in practice, consider the Japanese philosophy of “Ikigai”. “Ikigai” means "a reason for being." According to this concept, the secret to finding meaningful work is identifying what you love, what you are good at, what the world needs and what you can get paid for. In your ideal job, these four factors converge, and passion meets practicality. Unfortunately, most schools and colleges of today are not designed to inspire “ikigai” in students. They do their best to standardize creativity and mass-produce mediocrity, leaving their students frustrated and dissatisfied. It can be deeply unsettling to graduate from such an education system and then be bombarded with recommendations to “follow your passion”. How are we supposed to follow our passion without any institutional, cultural or systemic encouragement, career support or mentoring? This problem is particularly acute in Asian countries, despite the great innovators that the region has produced. Unfortunately, exceptions don’t disprove the norm. We need to do better if we want to meet the challenges of the future, especially as the average career is likely to increase by years and even decades. In their book “The 100-Year Life – Living and Working in an Age of Longevity”, Lynda Gratton and Andrew Scott make three key points. First, people have a real shot at living up to or more than 100 years. Second, the longevity of companies will shrink. Third, the whole concept of retirement and savings will change. The traditional three-stage life — full-time education leading to full-time work leading to full-time retirement — will give way to something a great deal more fluid, flexible, and multi-staged. Keeping the 100-year life in mind, one of the most important skills of the 21st century will be the ability to reinvent oneself quickly and repeatedly. Even with the best technologies available for free, it can be very hard and lonely to do this alone. Instead, we should harness the power of communities and data science. Peer-to-peer skill sharing can help people discover themselves, and then build careers that have a purpose and meaning. That’s what we are trying to do in our small way at Network Capital, a mentoring community. Personal responsibility coupled with the shared accountability of communities will help us embrace the Fourth Industrial Revolution equitably and sustainably. And that’s when “Follow your passion” will have concrete meaning.